With a minimum of care the handles of our tools will outlast the tool blades indefinitely. 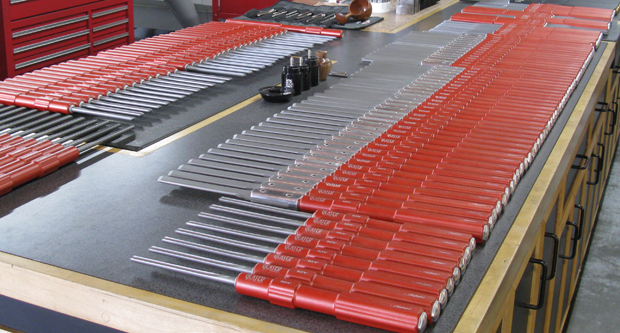 The key to the longevity of our tool systems is a reasonable amount of cleanliness. Tools that have been used with wet wood, should be wiped down prior to putting away for the day. Our patented quick disconnect system is a totally new concept in woodturning tools. When it comes to our newly developed “quick release system” (miniGlaser QR) please note that the tools are manufactured to the highest tolerances in the industry. The base of the blade should be free of excessive debris before inserting it into the handle adapter. If dirt is introduced into the handle connection system, simply wipe out with a Q-tip or remove it with compressed air. We have determined that acetone is a good cleaner for the adapters, but we do NOT recommend that it is used on ANY of our handles. The important thing to remember is that the tolerances of our modular system is very precise. Keeping the base of the tools reasonably clean will assure many years of enjoyable turning.